The Clearest in the industry- and we have the patents to prove it, They enhance color, contrast and definition. At the same time, 580 lenses reduce blur and haze, reducing visual fatigue by eliminating reflected glare. To top it off, LightWAVE™ 580G's are 22% lighter and 20% thinner than average polarized glass lenses. Try on a pair and you'll literally see the difference. These are the lenses that put Costa on the map. They're built to perform and offer clarity and definition that you don't find in any other brand. Costa 400's are available in LightWAVE glass (400g) and impact- and scratch-resistant plastic (400P) that's virtually as clear as glass. Made for open water. Encapsulated mirrors (glasses lenses only) deliver maximum contrast and color in full sun while eliminating glare. Encapsulated mirrors (glasses lenses only) offer enhanced visual acuity for fighing inshore, flats, rivers and streams. Perfect all-around choice for sports on water and land. Maintains color saturation and natural contrast in medium to bright sun conditions. Encapsulated mirrors (glass lenses only) optimize light transmission and enhance colors. Perfect for sight fishing or any outdoor activity with variable light. Made for sight fishing, driving and everyday activities. 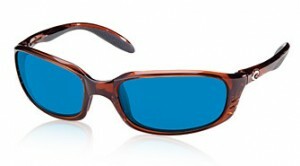 Cuts glare and enhances contrast and color, providing eye comfort in any conditions. Excellent all-around lens that delivers the brightest field of vision. Great choice for fishing, driving, and activities where high contrast is needed. A high-contrast specialty lens that allows maximum light transmission and enhances depth perception. Perfect for activities light fishing at dawn or dusk. Click the button below to add the Costa Del Mar Brine to your wish list.